Is AI a threat to religion? 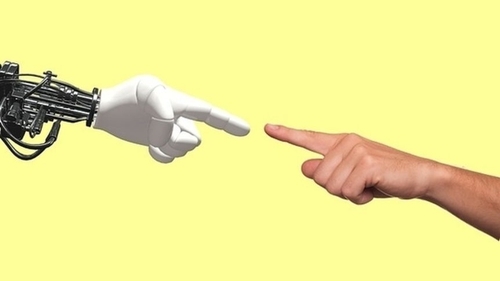 Report: if humans can recreate human intelligence in the form of AI, are we playing God? Michael Comyn on The Leap of Faith was joined by Reverend Dr Ian Paul, a theologian and member of the Church of England’s general synod; Professor Barry O’Sullivan, President of the European Association for Artificial Intelligence and Dr Mary Aiken, Adjunct Associate Professor at UCD to talk about the role of religion in Artificial Intelligence. Professor O’Sullivan went to work defining what Artifical Intelligence is. A definition, he says, that has changed over the years. "Back in the 1950s…the field was all about trying to completely automate human intelligence in every aspect… Today, really, what AI is all about is building very, very narrow solutions for very specific tasks." These specific tasks might be translating languages, directing you to your destination using GPS or turning on the lights in your house with a verbal command. But is this true intelligence? Professor O’Sullivan thinks that replicating tasks that humans could perform (like map reading) can be called Artificial Intelligence. But we may be under a kind of "illusion" as far as their scope. "It’s trying to find computer systems and develop methods that can outperform human beings in very specific tasks and give, I suppose, the illusion of intelligence, in that respect." Dr Aiken makes the point that we might be trying to replicate something we don’t understand. "I think that, as behavioural scientists, we barely understand how human intelligence works. Therefore, to think that we could replace it with something that we could develop or train or build, I think is fundamentally flawed." She concedes that there are some things AI can do very well. But in general, it misses out on some of the more "human" elements. "There are specifically ‘human’ areas, such as insight and intuition, that AI will struggle with." So, it has its limitations. But what significance does AI have in the realm of religion? Many religions tout the concept of the soul as what separates humans from other animals on earth. Reverend Dr Ian Paul warns against thinking that AI is capable of replicating humanity. "People talk about Artificial Intelligence and what it can do…and what they’re actually talking about is replicating phenomena." The ‘phenomena’ in question are those of the human experience. Reverend Ian described seeing a programme that took video clips of former US President Barack Obama and manipulated them to give the appearance that he was giving a speech of the author’s choosing. Quite literally, putting words in his mouth. He called developments like this "quite frightening". He believes that Christians generally reject the idea that this is on a par with human intelligence. "It isn’t actually being human. And one of the things that Christian theology would always do is stand over against the reduction of human experience to its phenomena…I think we need to be clear about what Artificial Intelligence is or is not doing." O'Sullivan pointed out that concern about humans being replaced or usurped by technological innovation is nothing new. He told Michael that AI researchers are "trying to remove the frictions in everyday life" and help people with tasks they find difficult or time-consuming. And as for how far down the road we are to replicating human intelligence, there’s a way to go. "I think if we can build an AI system that has the intelligence of a 6-year-old in the next 20 years, we’ll be doing very well."